Virtumonde Removal Tool - Remove Virtumonde trojan infection now! 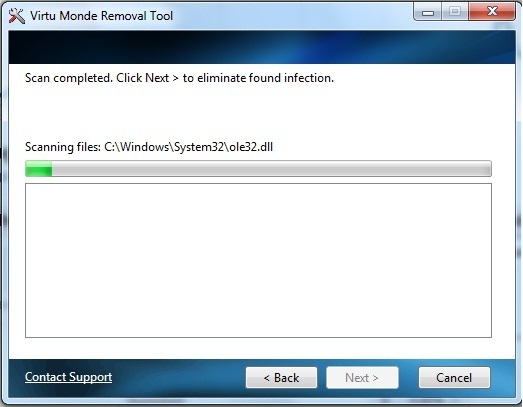 Remove Virtumonde trojan infection (also known as Vundo) and remove advertisements appearing everywhere in one click with this automated Removal Tool. The program cures all known modifications of Virtumonde trojan and fixes associated performance issues and popp-up error messages. Other antispyware programs delete the trojan itsef but leave a lot of problems caused by it like when you can't access internet, drives or folders, get error messages, face corrupted registry keys or malfunction of some legitimate Windows components. On the countrary, Virtumonde Removal Tool knows all possible consequences of Virtumonde trojan and not only removes Virtumonde infection itself but fixes all associated Virtumonde issues also, so your system is safe and sound again. In addition, 24/7 will help you in eliminating Virtumonde trojan infection in complicated cases.